It wouldn't be wrong to say Kangana Ranaut has earned a position as the goddess of controversy. Undoubtedly, she is a regular in headlines all across. The Queen actress's recent feat happens to be a dual defamation case filed against her by Aditya Pancholi and his wife Zarina Wahab, reports The Times of India. 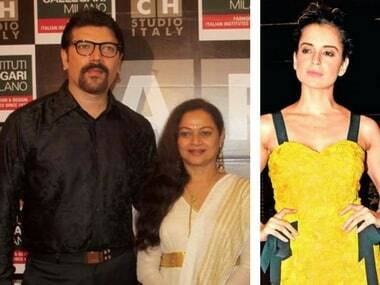 According to the report, the actor couple were not happy with Ranaut's response to their previous legal notice. Speaking about this development, Pancholi told the Times of India, "The legal team sent Kangana and her sister Rangoli notices, but their response wasn't up to the mark. We asked them to apologise unconditionally on the same national platforms where Kangana made those derogatory remarks against me. Eventually, her sister and she dragged even my son, daughter and wife into all this. That's the reason Zarina and I decided to file a defamation case against her, which is both civil and criminal." The "national platforms" that Pancholi alludes to happen to be numerous TV shows, media interactions — her interview with IndiaTV's Rajat Sharma on Aap Ki Adalat being the most controversial — that the actress was featured in prior to the release of her film Simran. Ranaut's lawyer, Rizwan Siddiquee, had responded to Pancholi's legal notice saying, "My client who has been a victim of crime has largely spoken about her personal experiences, which were already reported on various media platforms since the year 2007. Besides, the laws of the land do not give any added advantage to any male person to silence any (victim) woman under the threat of filing defamation proceedings against her," reports The Indian Express.